It's very expensive and the touchscreen is slow, but it's a great addition if you're a keen cyclist who wants to explore new routes. It's really hard to justify that price tag, though, especially if you already own a smartphone. GPS navigation devices are now pretty commonplace in our cars, but as the name suggests, the Mio Cyclo 505 HC Western Europe has been specially designed for bicycles. It's a great idea, since cycling is a popular pastime, so any device that can help us to find some picturesque routes to ride down gets the thumbs up from us. The device itself is small and sturdy and comes with all the necessary kit to attach the Mio Cyclo 505 HC to your handle bars. A heart rate monitor (HRM) that straps to your chest and a cadence/speed sensor kit that measures your peddling and wheel spins are also included, which is great if you want to use your bike to get fit. The touchscreen interface is fairly easy to use, with large buttons that look like a simplified Windows Phone interface. Maybe we've been spoilt by our smartphones, but we can't help but feel that the touchscreen is a bit too slow sometimes. The interface doesn't enable you to scroll up and down with your fingers either, so instead you have to press the appropriate buttons. After going from the snappy touchscreens of smartphones, this laggy experience leaves something to be desired. 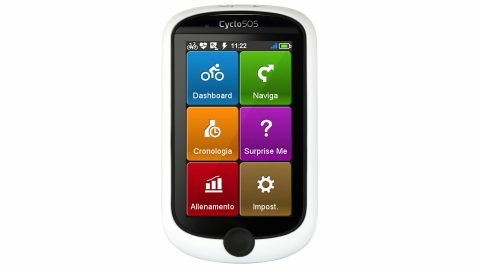 Following directions on the Cyclo 505 HC is pretty easy, and you can choose to have the device direct you to places of interest nearby, then choose a route depending on how much exercise you want to do. In our test ride the instructions were clear and easy to follow, with any deviations to the course quickly accommodated. Sat navs for cycling aren't as ubiquitous as ones for driving, but that doesn't mean the Mio Cyclo 505 HC has a nice open market ready for the taking. The biggest challenge that the Mio Cyclo 505 HC faces is from smartphones and the many cycling navigation and fitness apps that are available for them, which use your phone's built-in GPS receiver. In a similar ride we used a pretty standard Android smartphone and the pre-installed Google Maps app, which is completely free. It even comes with voice guided turn-by-turn navigation. Of course, we're not including the price of the actual phone, and we needed to buy a separate holder to attach the phone to our handlebars, but even with those considerations the £399.99 (around US$625/AU$695) asking price of the Mio Cyclo 505 HC seems incredibly steep - and you know how us cyclists hate steep things. It's not perfect, but it's a great addition if you're a keen cyclist who wants to explore new routes. The large price tag, and competition from smartphone apps, makes the Mio Cyclo 505 HC more difficult to justify, however.